Seeking Justice for Rural Ontario | Mothers Against Wind Turbines Inc.
Ontario’s Ministry of Environment and Climate Change (MOECC) has approved numerous wind energy projects across the province. But what if many of these approvals were improperly done, as determined by a court? Rural residents have appealed several wind projects to provincial tribunals, but most are denied because Ontario’s Green Energy Act permits these appeals only on very narrow grounds of irreparable harm to the environment or human health. For that reason, a citizen’s group in Prince Edward County recently filed for a judicial review of Ontario’s wind turbine approval process, in Superior Court in Ottawa. The appellant is a not-for-profit corporation composed of hundreds of Prince Edward County residents, who claim their Charter rights have been violated by Ontario’s Green Energy Act (GEA). They contend their rights have been violated by the “institutional bias” of the MOECC, and by its failure to properly consider matters of direct relevance to the wind energy project approval process. The filing also alleges “an egregious instance of regulatory capture”, of MOECC and its affiliated provincial agencies. In the view of the appellants, rural Ontario citizens receive only minimal procedural fairness under the GEA. During the project approval processes, they are not entitled to present direct evidence but are restricted to submitting comments to a website. In many cases, the information on which they are asked to comment is incomplete, as yet undisclosed, or subject to later amendment. Appeals to Ontario’s Environmental Review Tribunal (ERT) are possible, but again, only on very narrow grounds of proven, irreparable harm to the environment or human health. Property owners living close to wind turbines have complained about the pollution of wells, restriction of land use, fires, flying debris, health impacts, killing of wild life, property value diminution and inhabitability of homes. During and after construction, many municipalities are concerned about potential road damage, water pollution and financial damage to local economies. Many residents complain that once wind projects are completed, the province fails to meaningfully enforce regulations connected with their operation. 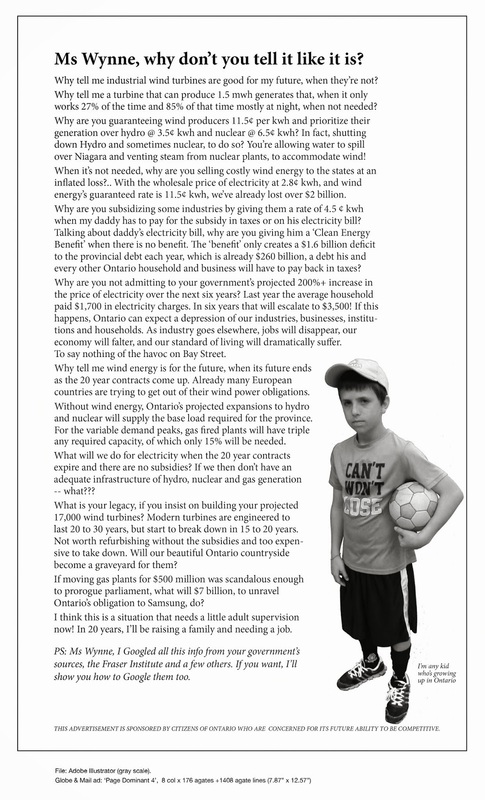 Provincially regulated setbacks of turbines, while inadequate in the view of many rural citizens, nonetheless effectively mandate that wind energy projects are built only in rural neighbourhoods, as opposed to cities like Toronto. Unlike cities, vote-poor rural communities are unable to successfully pressure the government to relocate wind projects they say are inappropriate. By contrast, in vote-rich Oakville and Mississauga, urban residents convinced the Liberal government, leading up to the 2011 provincial election, to relocate two proposed natural gas-fired electricity plants at an eventual public cost exceeding $1 billion. The Liberal government also suspended a proposed offshore wind project impacting urban ridings in Scarborough after protests by local residents. Under the GEA, municipalities can no longer use official plans or land use bylaws to protect citizens from inappropriate land use. Many believe this is a reprehensible failure by Ontario’s government, but it cannot be attributed solely to the provincial regulating agencies. In many cases, skilled, professional staff working for these agencies have basically been rendered inoperative by provincial legislation that makes them ineffective. Comparing rural citizens fighting industrial wind turbines to the Liberal government pulling the strings, one is reminded of what was said about Allied troops in the First World War: “We have lions led by donkeys”. Perhaps the judicial review requested by Prince Edward County residents will help restore fairness to the battlefield.